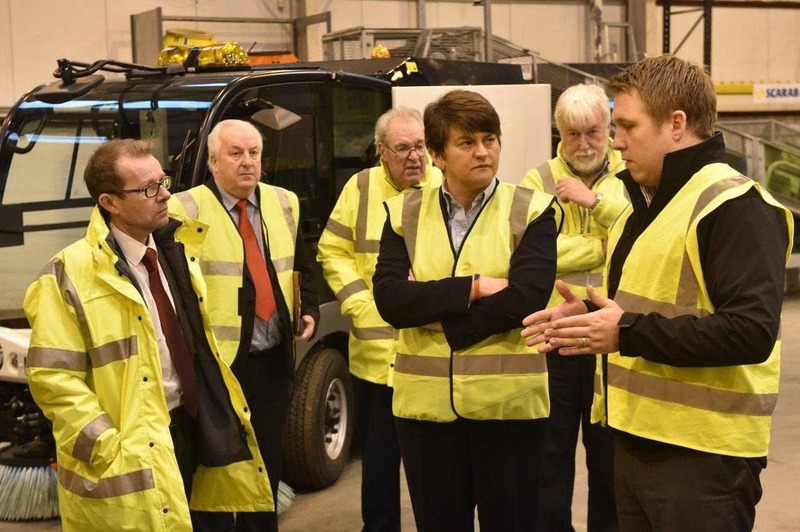 Arlene Foster, a Member of NI Legislative Assembly (MLA) for Fermanagh and South Tyrone, and Minister for Enterprise, Trade and Investment was among 52 delegates who attended a morning of practical and informative demonstrations regarding everyday hazards in the waste sector. The event was held on Thursday 26 February and was organised by the Waste Industry Safety and Health forum (WISHNI) in conjunction with Health and Safety Executive Northern Ireland (HSENI). Lisburn-based municipal vehicle hire and maintenance company, McCreath Taylor, hosted the event at their premises. The programme included sessions about Harness Safety by Quadra Consulting, Working Safely with Conveyors by Smiley Monroe, and Working Safely with Bin Lifting Gear by CP Davidson. Coventry-based vehicle safety technology company Innovative Safety Systems Ltd (ISS) also demonstrated its much talked about Cyclear cyclist warning display system and its market leading RX3 DVR Four-Camera Recording System. McCreath Taylor is the sole distributor and installation agent for ISS in Northern Ireland.